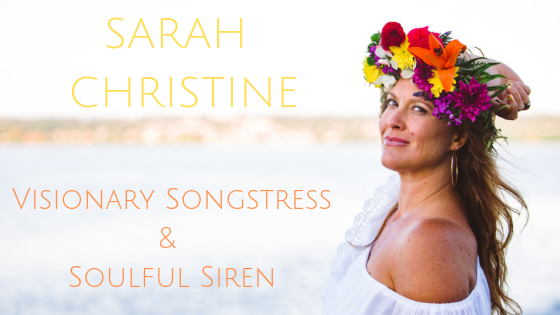 Sarah Christine’s music activates healing and transformation. She is a catalyst for change who uses her soulful, soothing siren to convey messages of pure love and Divine connection. Through high vibrational lyrics and heart opening affirmations, she creates uplifting musical experiences that ignite the senses & penetrates the soul! 100% of the proceeds from the sale of WE ARE ONE are being donated to an organization called the Unstoppable Foundation. This non-profit organization is working to eradicate poverty in Kenya, Liberia an Uganda through education, access to clean water and sanitation, health care, nutrition and job skills training for the adults of the communities. They work within villages one at a time, implementing these basic pillars and creating sustainable solutions so villagers can ultimately rise out of poverty and build better futures for generations to come. Your purchase of the song will translate into a direct donation, plus you will get an amazing song to listen to! I chose this particular organization because it encompasses so many of my core values into its mission and methods. I am very passionate about personal empowerment and believe that education, human rights, sustainability, health, wellness, clean water and food is an essential foundation in which to build a life of independence, strength and freedom upon. Can’t say in words how much your music touches me. Look forward to seeing you live again! You are magical and so talented! Much love light and laughter! I am sitting in the airport about 10 feet away from you. Woooo !!!! This is the best part of my business trip. You voice is sweet and floweeeee and your soul projects your inner light so well. It is a true pleasure to hear you and your stories . Truly lovely! I listened your live the day before yesterday at Seattle airport. and i said you are amazing! yeah, your voice is amazing and music is beautiful..! i’m so moved and touched, i’m also a musician in Korea. and if i have chanced to meet you again, i want to play piano with your voice and guitar. keep singing girl! Just meet you at the Seattle airport, such such a sweet soul you are. Never had a better time for my ears in the airport! Thank you for sharing your talent and making our day. We WILL be finding one of your shows to see!!! Could have talked to you forever. At Sip on Issy Highlands and listening to you here and absolutely love your vocal and instrumental gifting!!! A new soundtrack for my own life. Thank you. Gorgeous, soothing and inspiring. I love your CD. Every single song is awesome! Very cool reggae and I like your R&B as well. Very hip lyrics too. Just listened to the whole album, twice. Next time I’m at SEATAC I will pick up your other CD. Even though I loved your music the first time I listened to it, I love it even more the more I listen to it. You are truly a talented soulful siren with an awesome background vocalist, a delightfully funky bassist and a super hip drummer. I first met/heard your music at the SeaTac on my way to Miami, for July 4th weekend. It was brilliant. Got myself copies of your albums; best decisions I’ve made recently. Definitely checking out your next tour. Keep it up. It was an honor to meet you at the Sea-Tac airport yesterday. I have been enjoying your new album immensely since I have gotten home. Best wishes and regards! You sang to my soul today at the Lakewood Farmers Market. Thank you for blessing me. Listening to you right now in Sea-Tac!!! You are amazing!! If you are ever performing in Cincinnati I will make sure to bring out everyone I know!! Caught you briefly today at Seatac – your crystal clear voice cut right through the hubbub of the airport. So beautiful I bought two of your albums and downloaded them for my trip to Europe. True talent to stand up with just a guitar and deliver such beautiful vocals in SeaTac airport this afternoon. You made my brief wait so enjoyable. Wish “mainstream” music had more talent and sincerety like you! Keep doing what you are doing! Your soul soothed my soul between flights at Sea-Tac.. thank you. Love your vibe and songwriting skills. Keep playing, keep soothing, keep singing, keep using your gift. I wandered through a store in the Seattle airport. I heard you in the noisy store and your voice called to me with something I have been looking for a little bit of time. Peace, serenity, and love came forward as well as a deep well of inner experience, thank you! I was looking for something and there you were, I spent my hard earned money with you and I am so glad I did. You were singing “by the Sea”. And now that album is one of my favorite albums for doing what I do, Art! I listen and I am inspired. I love this album “whatever it takes” which speaks to me in so many ways! Peace in your heart, Sarah, and I appreciate what you have given me… peace in my heart! Mmmmmm! That is worth so much to me these days. A calm and healing voice soothed in a time of unrest and instability. I was the lady who came back and talked to you, shine as bright as you are meant to!